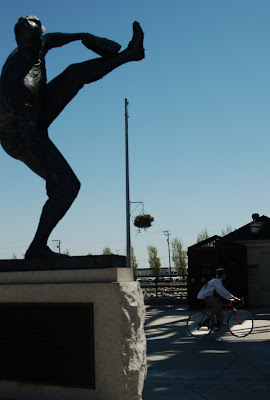 Vélo Vogue: take me out to the ballgame! My dad has season's tickets to the Giants, and so I am filled with fanatic elation when Spring comes! I attended my first game yesterday, and was thrilled to be able to park my bike at the SF Bicycle Coalition's free valet parking at the Giants Stadium. 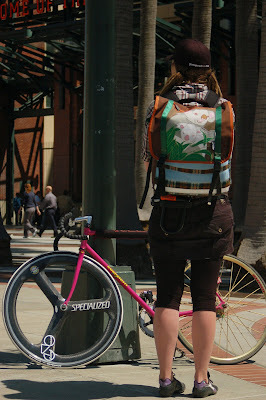 There were several other cyclists attending the game, sporting all different styles, like this messenger girl in her black mini with leggings, dreadlock ponytails tucked underneath her baseball cap, not to mention the cutest koala bear backpack and pink fixie. If only cycling were as American as baseball and apple pie. Excellent capture. I don't personally like the koala, blue and plaid style, but I love that it is something different. Have you ever noticed that the majority of timbuktu bags are on the shoulders of undergraduates not riding bicycles? Not saying that is bad, just makes the brand association change in my mind. Personally I like anything with cute animals on it. I'm that kind of a girl! Interesting comment on the timbuktu bags... Maybe through osmosis they'll eventually put their butts on bikes and not just messenger bags on their shoulders. I remember at my undergraduate university, there were many areas on campus off limits to bikes, which totally sucked for us cyclists.